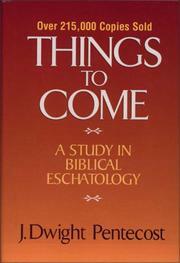 I read this book several years ago when I was a dispensational pre-millennialist as this author is. He did a good job at examining the various methods of interpreting scripture and then going through all the major views on the end-times. It gave me a much fuller and more complete understanding of pre-millennialism from a dispensational point of view. It helped me to see some areas that were doubtful (whether I wanted to admit it or not) and also gave me some understanding of the other views. Now that I am Amillennial in my eschatology, I know that the author had some misunderstandings of Amillennialism and nowadays I would look at some of those objections as incorrect. Other objections would be somewhere reasonable because all views have some weak aspects. I give this book 4 stars instead of 5 due to some of the weaknesses in his objections towards Amillennialism. If you want to learn dispensational pre-millennialism in great detail, then this is the book for you. It is quite long (600+ pages) but a great book. *I didn&apos;t borrow this from library, but I own this book.